Skippers are the sparrows of the butterfly world; lots of species, most of which are small, brown, and difficult to identify by amateur enthusiasts. They often are misidentified as moths, but a closer look reveals the straight antennae (not fuzzy like on moths) that identify them as butterflies. A skipper butterfly on gray headed coneflower. Restored prairie in Sarpy County, Nebraska. This particular skipper was sunning itself in a small prairie planting in Sarpy County (eastern Nebraska) last weekend. I have no idea what species it is – maybe some of you will know, but without seeing more of the wings, I can’t tell what it is. It flew off after I took this photo and I didn’t get a good look at it. 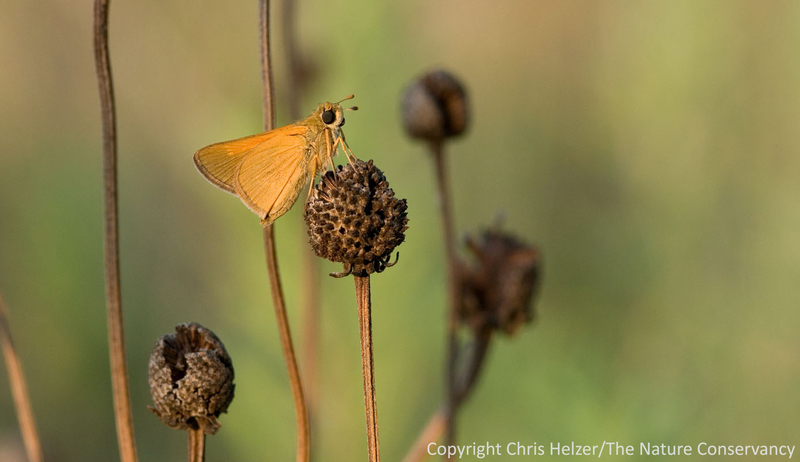 This entry was posted in Prairie Insects, Prairie Natural History, Prairie Photography and tagged butterfly, grassland, lepidoptera, photography, prairie, skipper by Chris Helzer. Bookmark the permalink. Hi Chris — A lot of moths do in fact have non-fuzzy antennae. The notable antennal characteristic of skippers is the tapering terminal club (spindle-shaped thickening) near the tip of the antenna. At least the folded wing skippers also have a very unique wing posture at rest or when feeding at a flower. Chris — I would say this is Tawny-edged Skipper (Polites themistocles). Thanks Aaron – No one is disagreeing, so I’ll take that as consent! It’s certainly a species that is common in the area. I appreciate the ID.